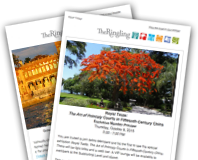 The Ringling is committed to making its venues and grounds accessible to all visitors. Tram rides and the availability of strollers and wheelchairs make getting around easy! Choose one of our suggested itineraries to help you navigate your busy day at The Ringling. Each itinerary includes interesting insights to engage you during your visit and an estimated time for completion. View policies for all photography, video, and sketching throughout the estate.